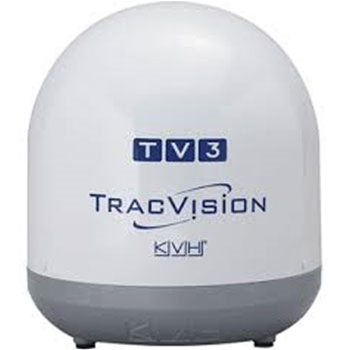 KVH’s TracVision TV3 with TV Hub is a powerful, compact antenna that supports DirecTV, Dish Network and Bell TV Service. Whether using as a single or multiple station setup the TV3 provides TV entertainment up to 100 nautical miles offshore. Order Now Through April 30th, 2019 and Get a $250 Mail-In Rebate From KVH! Compact Satellite TV Antenna with TV Hub! Small in Size, Big on Features! KVH's TracVision TV3 is a excellent choice for sailboaters or powerboaters looking for TV entertainment onboard. If cruising within 100 Nautical Miles offshore the TV3 is the way to go. Providing Great TV Entertainment options The TV3 is DVB-S2 Compatible and supports DirecTV, DISH Network, Bell TV and Circular and Linear Ku-Band services worldwide. Compact and Lightweight the TV3 provides high performance whether anchored or on the move. With a single coaxial cable for power, data and video installation is a breeze! Plus, The TV3 IP AutoSwitch option is great for multiple receiver installations allowing simple auto-switching on Dish Pro and DiSEqC-compatible services. Simple to Install, Set Up and Operate. With the included TV-Hub with built in Ethernet and Wi-Fi you can easily interface your Hub and receive system information from a simplied user interface with any Wi-Fi Device including Smartphones, Tablets, SmartTV's and Computer's. All the information you need to set up and troubleshoot your TV3 is available at you fingertips! NMEA 0183/2000 inputs for heading and GPS allow the fastest satellite acquistition available while Automatic Satellite switching allows access to local and national programming no matter where your travel takes you. 2 Year Parts / 1 Year Labor Warranty. Dome Size - 15.5"H x 17.6"W. 17 lbs. *HD Channels currently only available with Dish Network subscription when using the KVH TV1/3. Each KVH TracVision TV3 comes with: TV3 Dome, Power/RF Cable, IP-Enabled TV Hub and a Two-Year Parts, One-Year Labor Warranty.